Amelogenesis imperfecta (AI) is a rare genetic disorder inherited as either autosomal dominant, autosomal recessive, or X- linked modes. AI is characterized by the defect in enamel formation, resulting in defective mineralization or formation of the matrix. Restoration of the dentition poses great challenges, especially when teeth are severely affected. Treatment aims to relieve pain or sensitivity of teeth and to preserve as much tooth structure as possible while preventing further loss of teeth, to maintain masticatory function, and last but not the least, to improve the aesthetic appearance and quality of life as it has a great psychological impact on the self-esteem of the patient. 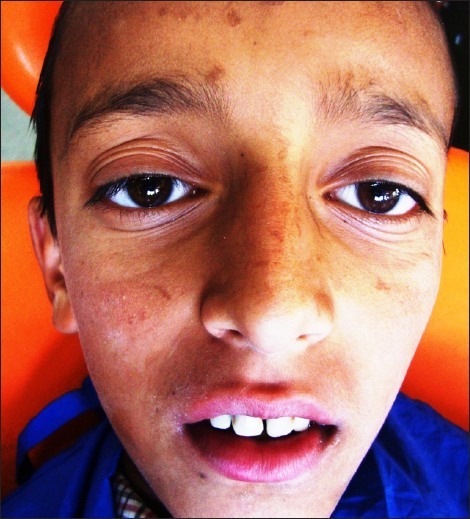 This case report describes the treatment of a young boy who presented with a severe form of AIimperfect (AI) with a minimally invasive, relatively simple, and cost-effective treatment with composite restorations. An 11-year-old boy reported to the Department of Pedodontics and Preventive Dentistry of H.P. Government Dental College and Hospital; Shimla, Himachal Pradesh with the chief complaint of discolored teeth since childhood. Apart from this his past medical and family history was nonsignificant. On intra-oral examination, it was found that he had a normal complement of teeth. The thickness of enamel was reduced to a great extent and was almost completely chipped off from some teeth, exposing the dentin. The surfaces of the teeth had a rough texture exhibiting a yellowish brown discoloration, with diffuse pitting present on the exposed surfaces of the teeth, more prominent on the labial and buccal aspects. The pattern of emergence and timing of shedding of teeth seemed to be delayed than for the normal range. An open bite was present. Examination of the periodontium revealed the presence of chronic, generalized, marginal, and papillary gingivitis, with the deposition of calculus and unsatisfactory oral hygiene [Figure 1]. A provisional diagnosis of hypoplastic type ofAIwas made on the basis of typical, clinical, radiographic, and histological features, along with a differential diagnosis from environmental enamel hypoplasia, dentinogenesis imperfecta, dentin dysplasia, regional odontodysplasia, and the tricho-dento-osseous syndrome. 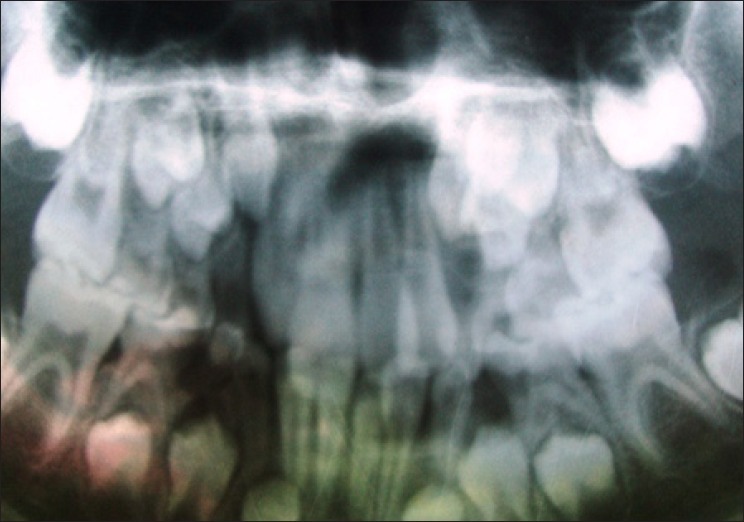 Radiographic investigations included an orthopantomogram (OPG) and full-mouth intraoral periapical (IOPA) radiographs. The OPG showed the presence of all unerupted permanent canines, premolars, and second molars [Figure 2]. AI is a rare inherited disorder, ranging from a defect in the formation of the enamel to the coexistence of other medical disorders. ,, Both the primary and permanent dentitions are affected. 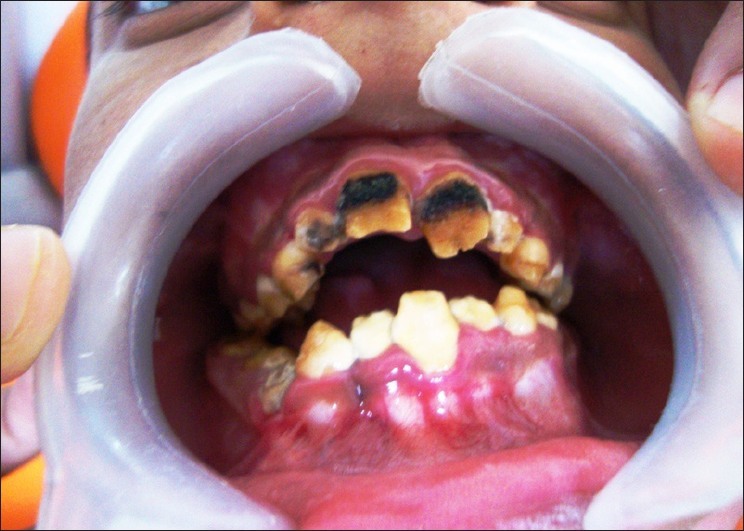 In this case, the patient presented with severe tooth wear due to inherited abnormal development of the enamel. The poor appearance was due not only to the innate color of the teeth, but also to increased staining, chipping, and spacing between the teeth. Treatment of such patients with AI requires special care. They are sometimes psychologically affected due to the poor appearance of their teeth, and esthetic improvement can affect their self-confidence and esteem. In general, little is known about both the etiology of AI and the appropriate dental materials used to restore tooth defects. An appropriate selection of restorative materials is important to preserve function and occlusal harmony and to restore the natural dentition morphology. Resin composites, glass ionomers, modified glass ionomer cements, or a combination of these materials are recommended for restoring developmental dental enamel defects. Besides the esthetic properties of these materials, their adhesion to the structure of the tooth is an advantage that may avoid the unnecessary removal of sound teeth. In this case, it was clearly observed after esthetic restorations with the help of polycarboxylate crowns. Owing to the highly discolored dentine, a more opaque ceramic material had to be used. Although the crowns could have been improved further, as he was contended and were acceptable to him [Figure 3]; thus, no further alteration was done. The treatment required the commitment of a very long period, which was not possible as it would mean visits to the hospital for the patient from a far-flung area of the hilly state. Unfortunately, some patients seek clinical advice only when they present with problems like: poor esthetics, sensitivity of teeth, and gingivitis. These are the most common problems related to AI patients. Rather I would reiterate that, more complex problems like loss of occlusal vertical dimension and skeletal open bite should also be taken into consideration. In nutshell this case report demonstrates a minimally invasive, relatively simple, and cost-effective option for the correction of hypoplastic AI with composite restorations. 1. Crawford PJ, Aldred MJ. Amelogenesis imperfect - A case report. Hong Kong Dent J 2006;3:123-7. 2. Sundell S, Koch G. Hereditary amelogenesis imperfecta. Epidemiology and clinical classification in a Swedish child population. Swed Dent J 1985;9:157-69. 3. Wright JT, Robinson C, Shore R. Characterization of the enamel ultra structure and mineral content in hypoplastic amelogenesis imperfecta. Oral Surg Oral Med Oral Pathol 1991;72:594-601. 4. Robinson C, Briggs HD, Atkinson PJ, Weatherell JA. Matrix and mineral changes in developing enamel. J Dent Res 1979;58:871-82. 5. Simmer JP, Fincham AG. Molecular mechanisms of dental enamel formation. Crit Rev Oral Biol Med 1995;6:84-108. 6. Mahoney EK, Rohanizadeh R, Smail FS, Kilpatrick NM, Swain MV. Mechanical properties and microstructure of hypo mineralized enamel of permanent teeth. Biomaterials 2003;25:5091-100. 7. Aldred MJ, Savarirayan R, Crawford PJ. Amelogenesis imperfecta: A classification and catalogue for the 21st century. Oral Dis 2003;9:19-23. 8. Weinmann JP, Svoboda JF, Woods RW. Hereditary disturbances of enamel formation and calcification. J Am Dent Assoc 1945;32:397-418. 9. Neville BW, Damm DD, Allen CM, Bouquot JE. Oral and maxillofacial pathology. 2 nd ed. Philadelphia: Elsevier; 2002. p. 89-94. 10. Rao S, Witkop CJ Jr. Inherited defects in tooth structure. Birth Defects Orig Artic Ser 1971;7:153-84. 11. Coffield KD, Phillips C, Brady M, Roberts MW, Strauss RP, Wright JT. The psychological impact of developmental dental defects in people with hereditary amelogenesis imperfecta. J Am Dent Assoc 2005;136:620-30. 12. Pindborg JJ. Aetiology of developmental enamel defects notrelated to fluorosis. Int Dent J 1982;32:123-34. 13. Schulze C. Developmental abnormalities of the teeth and jaws. In: Gorlin RJ, Goldman HM, editors. Thomas' Oral Pathology. 6 th ed. St Louis: Mosby; 1970. p. 96-178. 14. Michaelides M, Bloch-Zupan A, Holder GE, Hunt DM, Moore AT. An autosomal recessive cone-rod dystrophy associated with amelogenesis imperfecta. J Med Genet 2004;41:468-73. 15. Croll TP. Restorative options for malformed permanent molars in children. Compend Contin Educ Dent 2000;21:676-8, 680, 682.